Army Spc. Luis D. Santos, of Rialto, who attended Fontana High School, died of injuries received when a bomb exploded near his vehicle during combat operations in Buritz, Iraq, June 8, 2006. He liked shop class, loved cartoons and adored his family. He ran track and cross-country. His friends called him Toast. Spc. 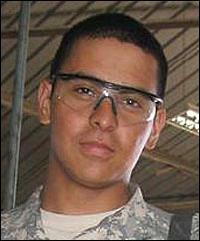 Luis D. Santos, 20, joined the Army after high school and was deployed to Iraq in November. He was supposed to be home at the end of the month, on a two-week leave. Santos died Thursday when a roadside bomb exploded near where he patrolled in Buritz, Iraq, officials said. "We were getting ready to have a little get-together," his mother, Irma Santos, of Rialto, said Friday. "Now it's going to be very different." Before the bomb exploded near his vehicle, Santos -- not even old enough to legally drink -- logged his war experiences on MySpace.com, a social-networking Web site. "In june i will be home again, I am excited to be seeing my friends and family again. ... Can't wait,im so hyped up, just got to stay alive till next month." The tone of his writing ranges from discouragement about the Iraqis' chilly reception to American soldiers and apprehension about his safety to optimistic musings about his family and future. "i want to go home to mom cause i know how much she misses me.I can't wait to hug mama.Oh well, got to keep on keeping on," he wrote in May. "My family are my heros." Santos kept in touch with his girlfriend through MySpace as well, and two days before he died, he sent her a message telling her not to worry. "I am going to be gone for a few days so dont get upset if i dont write you in a while.I promise that as soon as i get back i will write you.ok baby i love you and i cant wait to see you.bye i love you." Santos served as a cavalry scout in the 3rd Heavy Brigade Combat Team, which is based at Fort Carson, Colo., and is part of the Army's 4th Infantry Division, Fort Carson spokesman Lt. Col. David Johnson said. Soldiers assigned to cavalry scout duties traditionally ride ahead of their unit's main force on reconnaissance missions, Johnson said. Pentagon spokesman Maj. Nathan Banks said Santos was a passenger in a Humvee with at least one other soldier when an improvised explosive device -- essentially a homemade bomb -- detonated near the vehicle. Santos died of his wounds on Thursday. He was the only soldier who was killed by the attack, and it was unclear if anyone else was wounded. Banks said improvised bombs used by insurgents are the primary cause of U.S. combat deaths in Iraq. Plans have not yet been solidified, but the family intends to bury Santos at Riverside National Cemetery. "He wanted to make us proud and he did," his mother, Irma Santos, said Friday. "He wanted to experience something more and serve his country and become more mature as a person." Teachers, staff and students at Fontana High School were reeling Friday from the news of Santos' death -- barely one month after another former Fontana High School student -- Sgt. Bryan Brewster, 24, was killed in a helicopter crash in Afghanistan. "This is getting to be real tough on our campus community," Principal Tom Reasin said. "We care about each other, and when we lose somebody it hits hard." Fontana High School seniors are preparing for their graduation on Wednesday. Santos' younger brother Eric is among them. "He should be at a high point in his life and celebrating, but instead he's having to deal with loss," Reasin said. Before his sister called Thursday with the tragic news, Eric was thinking about his graduation and his recent enlistment into the Army.